Description: Brawl with Other Brains! The Wii sequel includes three multiplayer modes for up to eight players. You can also exchange training data with other players over WiiConnect24 and compete against their save data. Weigh Your Brain! With 15 new Activities that challenge your brain in single-player Test and Practice modes, Big Brain Academy Wii sees how you measure up in five categories: memory, analysis, number crunching, visual recognition, and quick thinking. Train with the Wii Remote! All Activities are designed around the Wii Remote's Pointer, so you can have fun learning from the comfort of your couch with one Wii Remote, or pass around two Wii Remotes for group competitions. Mii data compatible. 08-02-2011 desocietas Description Brawl with Other Brains! The Wii sequel includes three multiplayer modes for up to eight players. You can also exchange training data with other players over WiiConnect24 and compete against their save data. Weigh Your Brain! With 15 new Activities that challenge your brain in single-player Test and Practice modes, Big Brain Academy Wii sees how you measure up in five categories: memory, analysis, number crunching, visual recognition, and quick thinking. Train with the Wii Remote! All Activities are designed around the Wii Remote's Pointer, so you can have fun learning from the comfort of your couch with one Wii Remote, or pass around two Wii Remotes for group competitions. Mii data compatible. 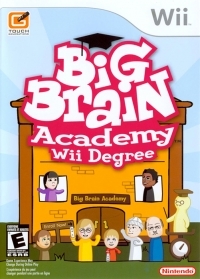 This is a list of VGCollect users who have Big Brain Academy: Wii Degree in their Collection. This is a list of VGCollect users who have Big Brain Academy: Wii Degree in their Sell List. This is a list of VGCollect users who have Big Brain Academy: Wii Degree in their Wish List.